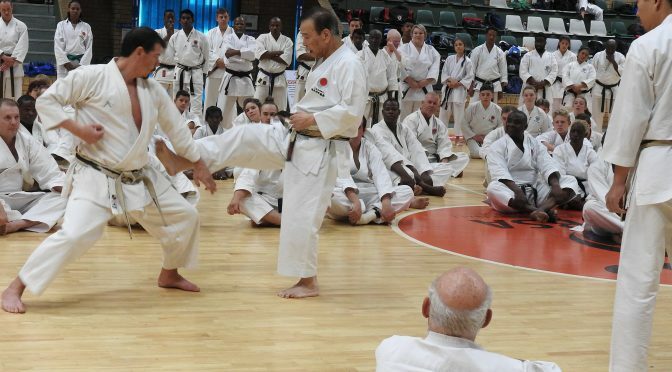 When sensei Okuma visits South Africa, we cannot wait to attend at least one of his sessions. We had the privilege to have trained with the best; Chief Instructor of JKA/WF: Shuseki Shihan Masaaki Ueki Sensei (9th Dan) and International Affairs Division JKA/WF: Shihan Koichiro Okuma Sensei (6th Dan). Both senseis’ presented morning and evening sessions at the Mandeville Sports Complex in Johannesburg, 28 – 31 August 2018. As this was part of JKA’s 2nd Africa Cup for the Junior and Senior Karate Championship Tournament, on 1st September 2018, we had visitors from Mauritius, DRC, Angola, Kenya, Zimbabwe, Mozambique, Madagascar and Reunion. JKA also held a Technical seminar, Judge seminar, Dan examination and Qualification exam before the championship. We are exceptionally proud of Sensei Eugene who was part of those who did the ABC international exam and passed all three (judge, examiner and instructor) and is now proudly on BCB level. Well done sensei. We are proud of you. You are really an inspiration for Solis Ortus and especially a role model to our young athletes. Shuseki Shihan Masaaki Ueki Sensei and Shihan Koichiro Okuma Sensei were present at the Dan gradings as well. The training with Masaaki Ueki Sensei and Okuma Sensei was well presented and concentrated on fundamentals such as hip movement, axis centre line, weight distribution, expansion and contraction, turning on the heel, turns and bunkais in katas Jion, Bassai Dai and Kanku Dai. Solis Ortus was well represented at the seminars and we are definitely on par with JKA International. Thank you SAJKA HQ for the opportunity to have trained with the best. “The heights by great men reached and kept were not attained in sudden flight. But, they, while their companions slept, they, were toiling upwards in the night”.